Select Motors is aware that not all vintage cars have been through a “nuts and bolts” type restoration or necessarily need one. For this reason, we offer classic & vintage car maintenance & repair. In an ever growing market of vintage auto sales, we are often called upon for antique car repair. 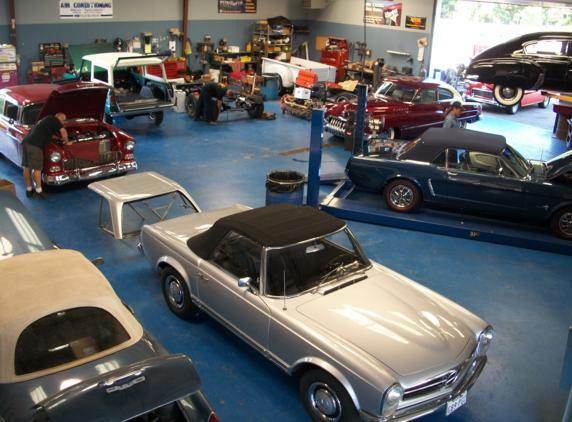 Whether you need to address drivability or cosmetic issues, or simply want to update or upgrade individual systems on your classic vehicle, Select Motors values your business and offers a complete menu of classic & vintage car maintenance & repair services. These services include both foreign and domestic vehicles. Our knowledgeable staff excels in making aftermarket parts work well together and integrating them with the original equipment. Whether you need muscle car repair, hot rod repair, or want to update your classic car, the auto restorers at Select Motors have the knowledge, the expertise, and the experience to handle all of your vintage car repair and maintenance needs. From the GM line up including the Camaro, Corvette, Tri 5 Chevys, GMC and Chevy Trucks and El Camino, the Ford Mustang, Galaxie, Bronco, Ranchero and Ford Trucks, Mopars and foreign vehicles including Mercedes-Benz, Volkswagon, Triumph and BMW we’ve got you covered. Browse through our mechanical services, view photos of our work in progress, and completed auto restoration projects. You will find Select Motors offers turn-key, fully functional, no excuses, ready to drive classic cars. Let us get the mechanical systems on your vehicle working properly. After all, you need to be out there enjoying your classic!